The Bay Area group known as Rosie the Riveters flew to Washington, D.C. as part of Vice President Joe Biden’s special invitation. Diane Dwyer reports. Gould is one of six Rosie the Riveters from the San Francisco Bay Area who flew to Washington, D.C. at Biden’s special invitation. She and her pals had been electricians, welders and draftsmen at the Kaiser Shipyard in Richmond, Calif. during World War II. Several of the women, now in their 80s and 90s, still work as docents at the Rosie the Riveter/World War II Home Front National Historical Park. In October, Biden surprised Gould with an out-of-the-blue phone call as part of the “Being Biden” audio series. He called her "impressive," and said he would be honored to meet the Fairfax, Calif. woman who used to be a journeymen welder in the 1940s. He also promised that if they met, he'd give her a "real hug." 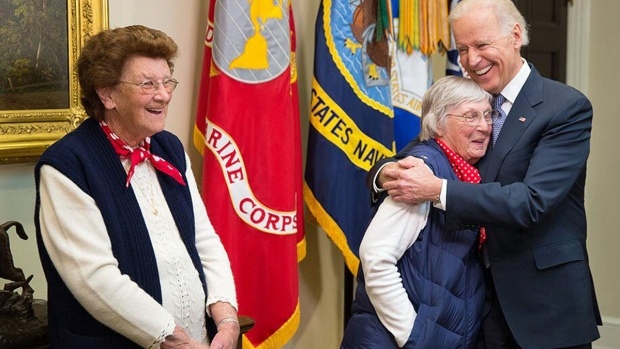 Elderly "Rosie the Riveters" Raise Money to Meet Joe Biden in Washington, D.C.
For a while, it looked like the Rosies might not be able to make it to Washington, since they live on fixed incomes and didn't have money for the flight or hotels. After they took their story public, funds eventually poured in. More than 100 donors pitched in about $30,000 to pay for their trips, and a chaperone each, to steer the elderly women around the nation’s capital. For more information on Rosie the Riveters, visit www.rosietheriveter.org.